Did you know Manny Pacquiao was fighting Lucas Matthysse this weekend? Did you know it’s not on pay-per-view unless you want to count ESPN+? Do you care? Unlike his counterpart, Floyd Mayweather, Pacquiao’s legion of supposed fans left him right after his lackluster loss to Mayweather. If it wasn’t for the fourth round of that right, you wouldn’t have known Pacquiao was even in the ring. After the fight there were a bevy of excuses. There was the “Mayweather ran” excuse despite the fact that the majority of the fight was fought in the middle of the ring. There was the mystery shoulder injury that magically popped up despite the fact that it never appeared on any of the required medical forms. Then there’s the “if the fight was fought five years earlier” excuse when we don’t know if Pacquaio could’ve passed a drug test during that time. Most were never fans of Pacquiao. In what might have been the best hustle job we’ve seen in modern day boxing, Pacquiao saw an opportunity to make millions selling the hope of beating Mayweather. And, lets be honest, he did a great job doing it. Pacquiao’s wins over Ricky Hatton and a drained, Miguel Cotto played right into the strategy. Casual fans were quick to point out how Mayweather didn’t defeat either fighter as easily. But, that was fool’s gold based on fighting style. Unlike “Pretty Boy” Floyd, “Money” Mayweather used early rounds to “collect data”. This was on full display versus Hatton where he was behind on the scorecards early but was never in trouble. He continuously wore Hatton down until the 10th round knockout. Against Cotto, Mayweather fought him at the full blown 154 weight, something Pacquiao didn’t do. That’s why comparing the results is flawed. But, no matter, Pacquiao had the public and he knew it. Delaying the fight with Mayweather meant more money for both. It was a brilliant strategy that Marvin Hagler didn’t have the benefit of when Sugar Ray Leonard stalled him out for years. Leonard ended up being able to dictate the terms of the fight, walk away with more money and steal a win. Hagler never fought again. This is the swan song for Pacquiao. Who fallen so far that his fight against Jeff Horn was in Austrailia and his fight with Matthysse is in Malaysia. In his loss to Horn, he looked like a shell of himself in front of a national audience on ESPN. He’s turned into a lounge fighter but at this point how many people notice? How many people care? 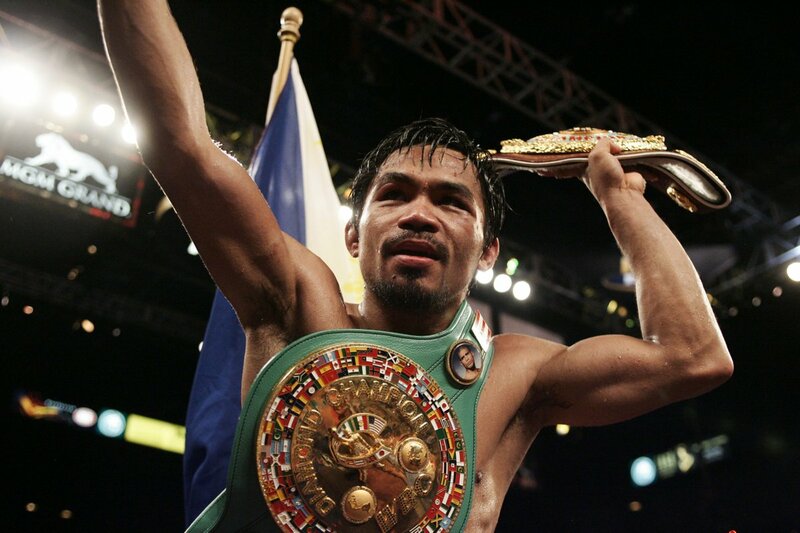 Pacquiao ran one of the greatest hustles in boxing history and like most con artists, he’s fading off into obscurity.